Dr. Pilar Silverman, second from left, with colleagues. 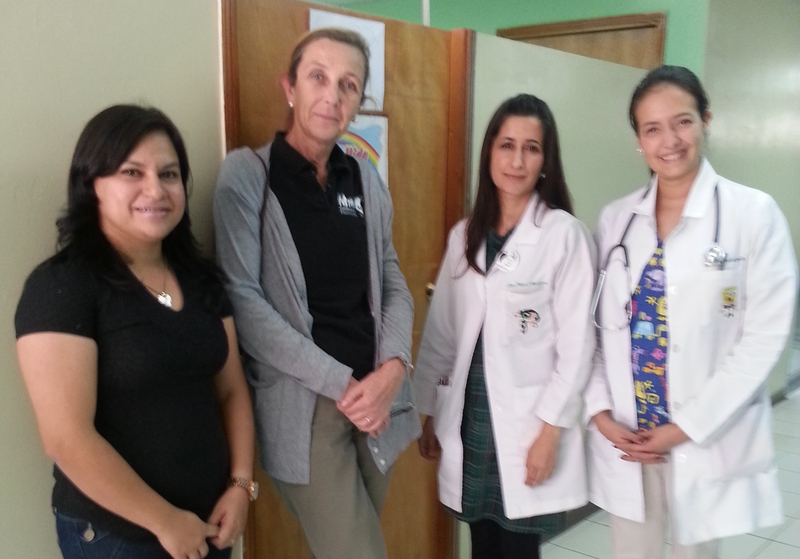 NPHI Director of Medical Services, Dr. Pilar Silverman, along with the local NPH Honduras health coordinator and local doctor, meet with the directors of the Honduras Pediatric HIV Clinic, which operates out of Hospital Esceula, in Tegucigalpa. Currently, the clinic has more than 200 children in the program, 24 of them from NPH Honduras. During the meeting, challenging cases were reviewed and a common strategy was developed to improve integral care for our pequeños. The clinic gave us the news that our NPH children can now receive extended care at this clinic until the age of twenty-four. One of the challenges the clinic encountered was that when youths aged out of the program, many abandoned their treatment. Thus to improve and keep the adherence to medication (vital to keep patients out of health complications and get into AIDS status) they will keep youths under their care for longer, ensuring the patient understands the scope of the disease. The hospital also offers a support group. At NPH, we strive to reinforce the psychological support to enable children to understand the disease and to care for themselves, prevent stigma, or how to deal with it, and work with on their self-esteem. NPH has been able to include several of the clinic’s patients, who needed second and third line of therapy, in the Aid for Aids program, a US based non-profits that help thousands of people living with HIV/AIDS around the world. Aid for Aids not only provides lifesaving antiretroviral drugs, but they have a group of dedicated professionals advising all of us in Honduras on challenging cases. Furthermore, NPH is the one who transports and distributes the medicines that Aid for Aids donates on a regular basis. Honduras, along with Guatemala, according to UNAID, has more incidence of HIV/AIDS in Central America 0.7% (before 1.2%). If we compare with the Caribbean, the Dominican Republic has 0.5% and in Haiti 2.1%. Overall the directors of the pediatric HIV team do a fantastic job in caring for their patients, not always with optimum conditions and resources. Despite the many challenges, the work that NPH has and is doing, is outstanding, taking into consideration that less than 20 years ago, children with HIV from birth didn’t reach the age of two.